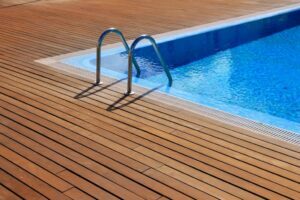 Why Teak Flooring & Patio Decking? – Teak is one of the best wood-flooring materials with an extraordinarily high resistance to sun, temperature, water, rot, and insect damage. Teak is non-skid even when wet and can be walked on barefoot in the tropical sun. Its rich, earthy tones and smooth grain give teak flooring a feeling of true authenticity and luxury. Homeowners interested in improving the quality and appearance of their residence should consider teak flooring and patio decking. There is growing demand for teak in high-end homes, restaurants and hotels. 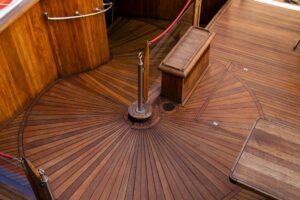 Teak has been used for centuries by boat builders because it is one of the worlds most resilient woods. It is especially useful for applications in waterfront homes, on pool decks and in restaurants with outdoor seating. Florida Teak supplies high-quality Burmese teak products, custom-milled to the customers needs. We provide outside decking, tongue-and-groove flooring, paneling, planks, etc.- the applications are unlimited. High quality Burmese teak should not be confused with common furniture-quality teak, the two have very different qualities. Genuine high-quality Burmese teak doesn’t need oiling, and even if left completely unfinished, it will last for centuries in near-perfect condition. Click Here to find out more. Please ask about our special pricing on plank sizes suitable for outdoor decking and flooring. © 2019 FLORIDA TEAK. Site by PBIF.